Anguera, J.; Cabedo, A.; Picher, C.; Sanz, I.; Ribó, M.; Puente, C.
A technique consisting in designing the groundplane of a handset antenna is presented. The technique is applied to PIFA antennas to show how the bandwidth can be enhanced. Particularly, a dual-band PIFA operating at GSM900 MHz and GSM1800 MHz is expanded up to quad-band and hexa-band operation by means of groundplane design. Results for antenna efficiency show that the proposed technique can be applied to design multi-band antennas for handset phones. Anguera, J. [et al.]. 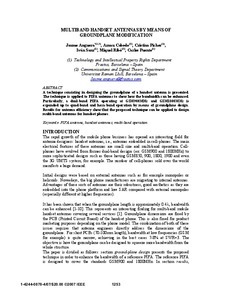 Multiband handset antennas by means of groundplane modification. A: IEEE International Symposium on Antennas and Propagation. "2007 IEEE Antennas and Propagation Society international symposium: Honolulu, HI, 9-15 June 2007". San Diego: Institute of Electrical and Electronics Engineers (IEEE), 2007, p. 1253-1256.